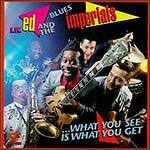 CD review: "... What You See Is What You Get"
Blues legend J.B. Hutto's nephew Lil' Ed Williams is only now, on his third release, coming into his own. "... What You See Is What You Get" is so much better than Williams' two earlier releases on Alligator that if you heard this album without knowing who it was, you might not guess it was Williams. "... What You See" shows a much more mature Williams, less inclined to engage in guitar pyrotechnics and more willing to work out thoughtful, jazz-like improvisational passages. The music is less rock, and more blues (including a moving cover of Hutto's "Please Help." There's never been any doubt that Williams could play guitar and sing; now that he's shown he can show more discretion in what to play and sing, his career should get a nice boost.